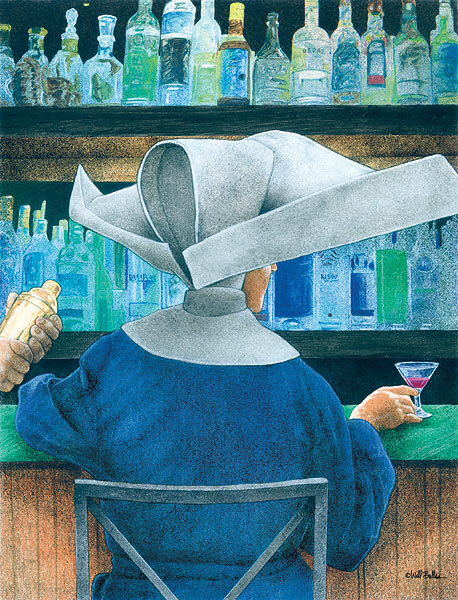 The Daughters of Charity of Saint Vincent de Paul are known worldwide for their good works and unfortunately, for this would-be anonymous bar patron, they’re also instantly recognizable. The cornette, or starched headdress, was an iconic part of the Daughters of Charity habit until the mid-1960s. Several years later, Sally Field’s cornette-inspired antics as The Flying Nun ensured the habit’s enduring place in pop culture history. Will Bullas’ bar scenes comprise some of his most legendary images. From Crabernet to the hare club… to the bar exam…, his colorful characters and punny titles make a cool and offbeat scene out of any basement bar, restaurant or kitchen wall. Bring home this new release today and make your home the hippest place in town, bar none!